Good morning! I just updated the Jennifer Jangles Shop as well as the Jangles Etsy Shop with all sorts of ceramic goodies. When I was mentioning it on Facebook the other day, someone asked me about the process. 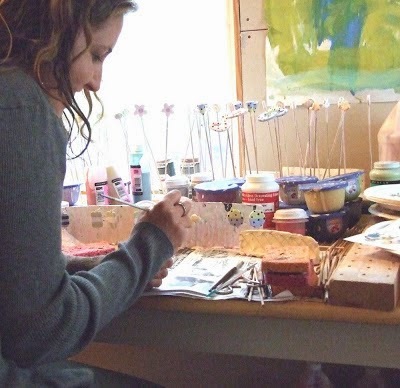 I realized these days I talk so much about sewing that there are probably lots of you folks who would like to know about my process of making my ceramic items goes. Here we go, I will walk you through step by step. 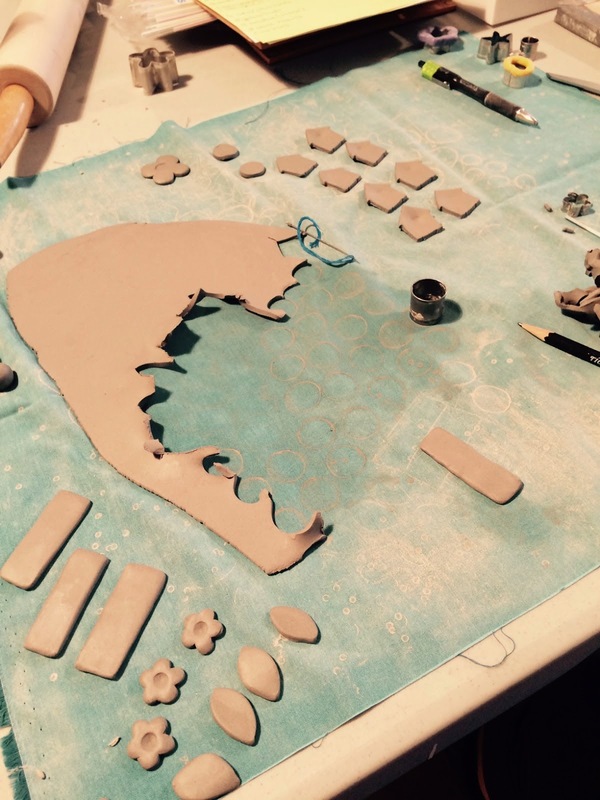 I start by rolling out clay to cut out buttons and pendants. 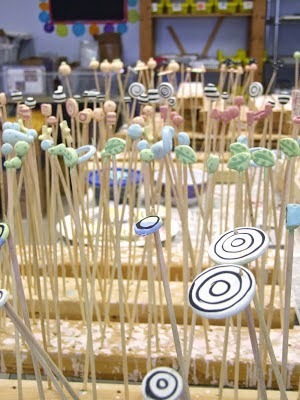 The edges are rounded and smoothed by hand so they don't chip once they are out of the kiln. 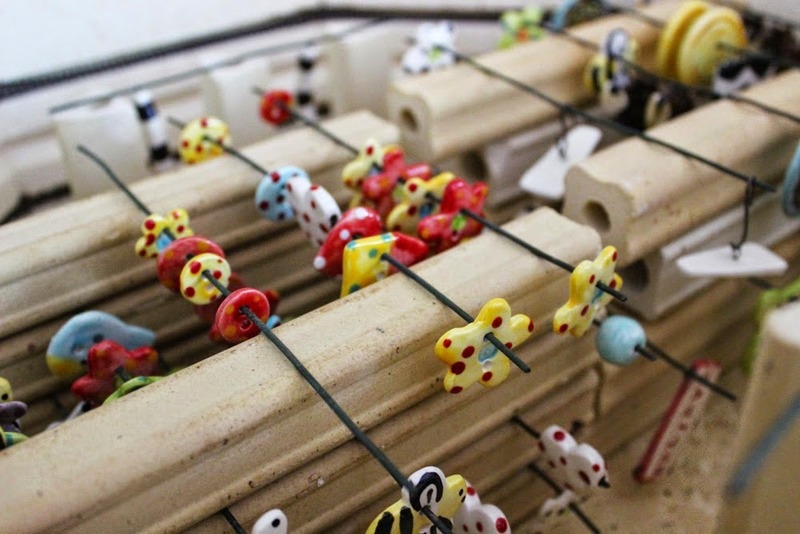 I hand form all of the three dimensional beads as well. 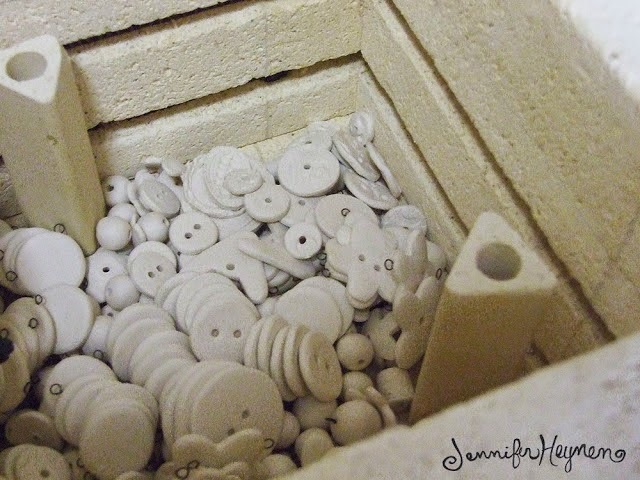 If the beads and buttons are flat, they are sandwiched in-between two plaster boards to prevent warping as they dry. 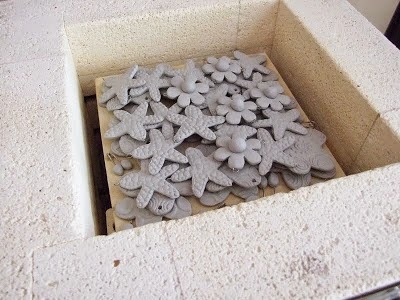 After a couple days of drying, the beads go into the kiln and are fire to almost 2000 degrees F. This is called the bisque firing. They come out bright white and no longer brittle. 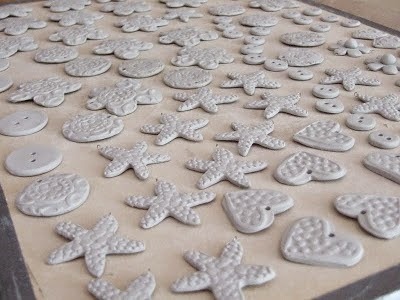 They are ready for glazing. I used underglazes to paint my beads. They are like paints where they can be layered and they don't move in the firing. 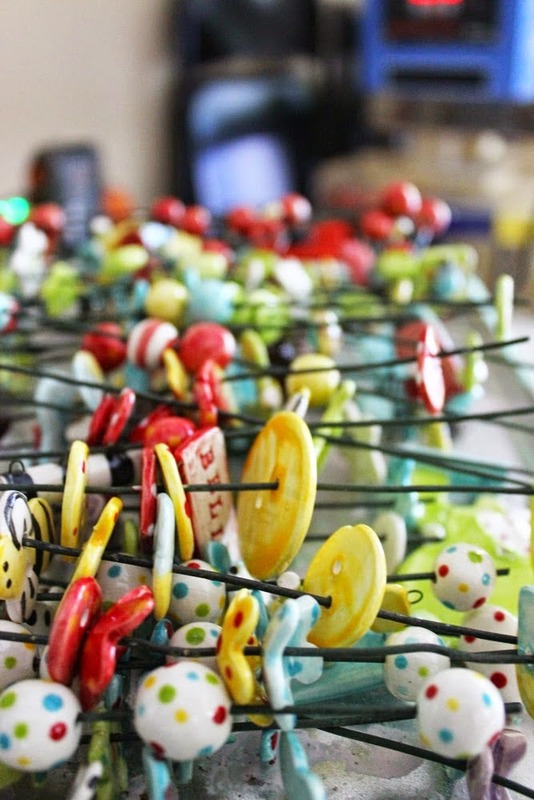 The beads and buttons are out on skewers while I paint them. This way I can get all sides with glaze. 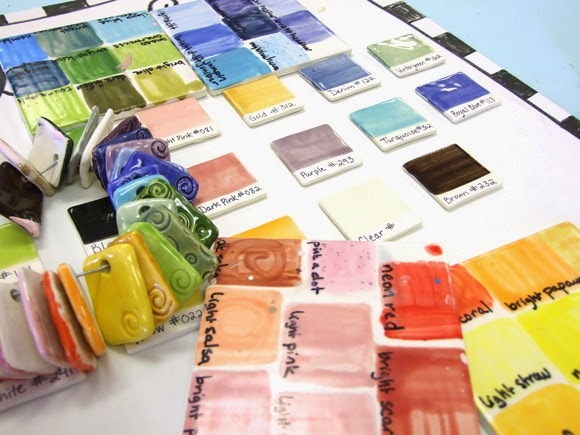 After they are all underglazes. I put a clear coat of glaze on top of the pieces. This is what makes them shiny. 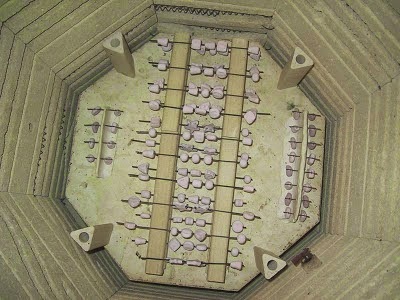 But when they go in to the kiln, they are all pink, the glaze isn't clear yet. 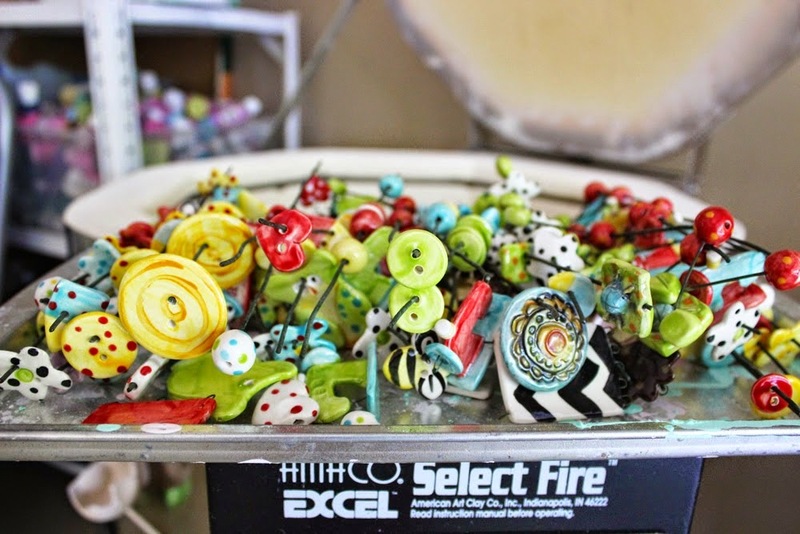 This time when the beads and buttons go in to the kiln they can't touch anything. The clear glaze runs and will stick to anything it touches. So everything is suspended on a wire in the firing. 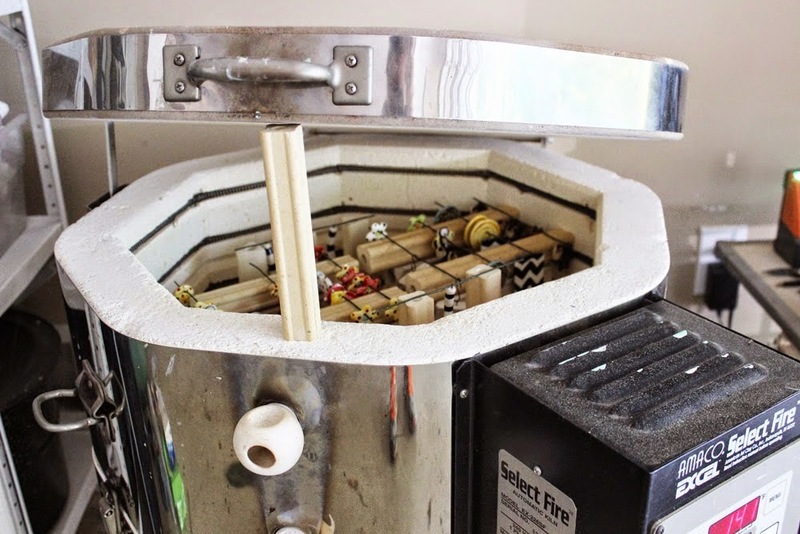 The kiln fires for about seven hours and then it has to cool completely before you can open it. I crack the lid once it's getting to cooler to speed the process up a little. Now they are all shiny and bright and ready to be unloaded. I put them on a tray and then they are ready to be sorted, put on cards, and photographed for the shop. 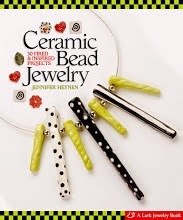 This is my book, Ceramic Bead Jewelry, that teaches you the process in detail if it's something you want to learn. You can find it on Amazon.